Hello there. 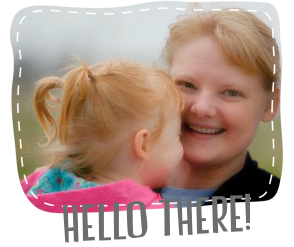 I am so happy you are here for the Fat Quarter Shop Classic & Vintage video series. 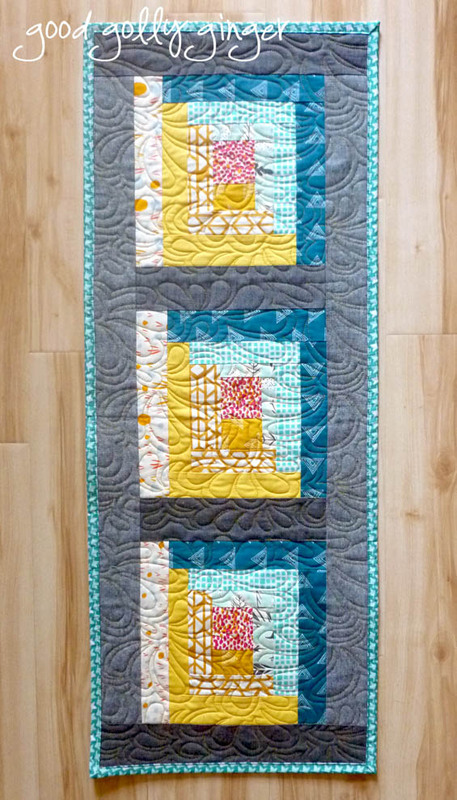 This particular hop is called Hope Blooms Log Cabin Quilt. The purpose for the Classic & Vintage series is to take classic, traditional blocks and make it fresh for today. Sounds great, huh? The pattern is free, and there is even a video. I decided to raid my Art Gallery fabric collection for this. I went for an aqua and gold color combination. 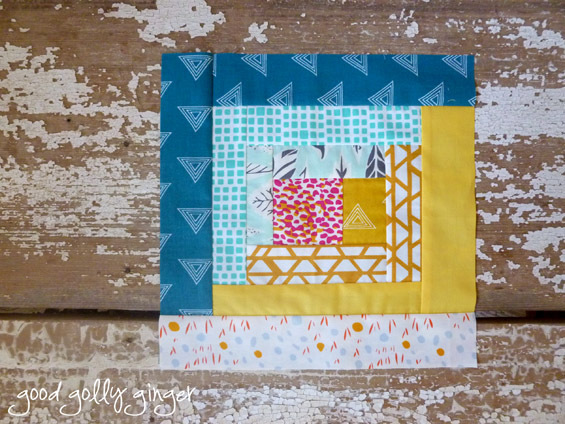 The block goes together easy-peasy, and it was way more fun to make than the traditional log cabin block. I love the modern wonkiness of this version. BTW, the pattern calls for using the Creative Grids Log Cabin Trim Tool...I'm sure that works well, but I didn't need the ruler for this pattern. Confession: I don't do dusting. Sometimes, but rarely. Table runners often keep me from noticing the accumulating dust. I can never have too many table runners for this reason. Can you? Three blocks plus some essex linen sashing equals DONE. Cat photo BOMB! Do you see her in the window. I am disturbing her quiet time. Also, don't look at the cat hair fur ball on the corner table! Remember, I rarely dust. A table runner will cover that! I quilted this with an edge-to-edge feather design in gold Isacord thread. I'm so glad I went with the bird fabric for the binding. I love the extra bit of whimsy. Just like you are not supposed to point out your quilting mistakes you are also not supposed to point out hair balls and the like. I too seldom dust as it doesn't last. Very nice table runner and quilting. I like it! Especially the yellow contrast stitching. Super cute! The gold thread is a great touch, as is the cute bird binding. Thanks for sharing! 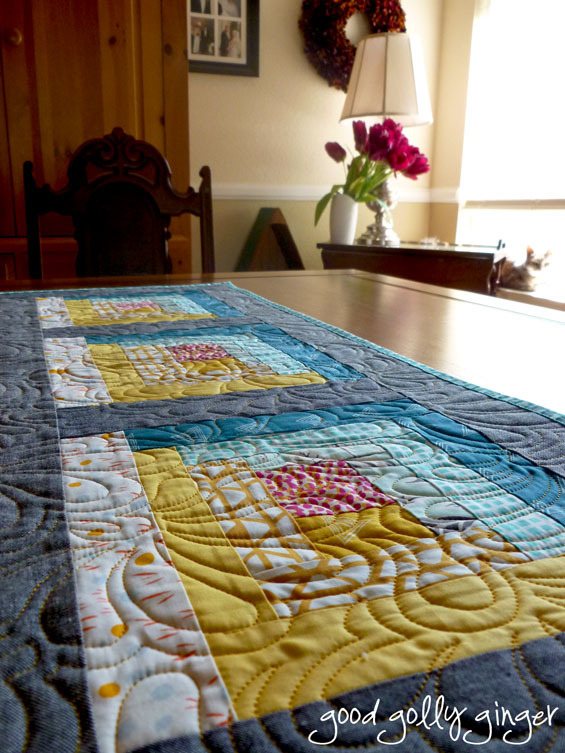 Great quilt and great quilting...thanks for sharing! 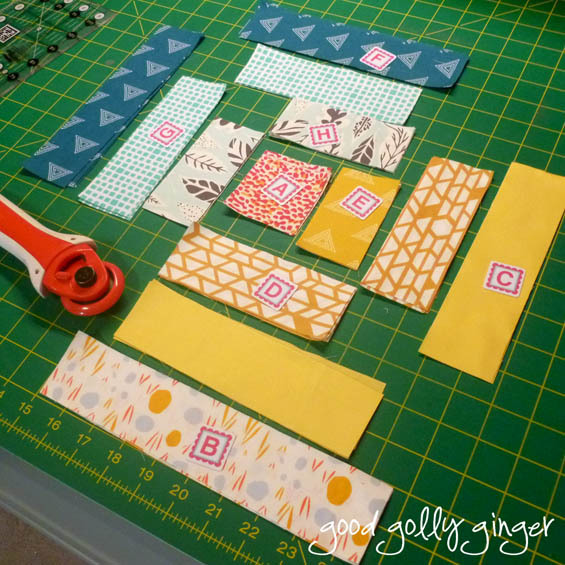 Love these blocks and your table runner. Great quilting. Yes, I use table runners and toppers throughout my house, too! I love your projects, this one included. 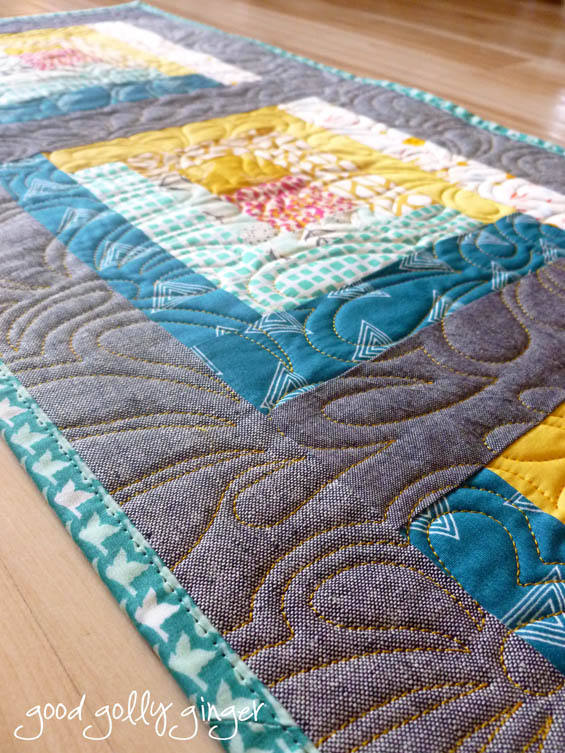 The quilting with the gold thread is so nice on the linen. Love the Blue and Yellow. This is great. Thanks for sharing. 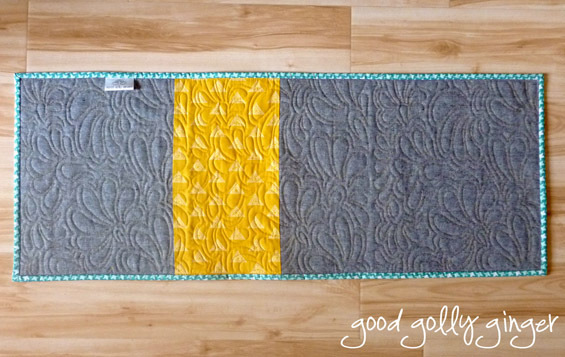 Your table runner is beautiful and the gold cord quilting is just the right extra touch!